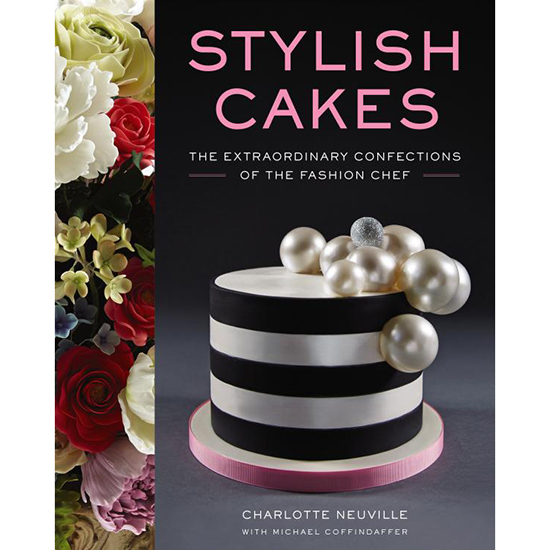 Charlotte Neuville‘s gorgeous cakes really are nothing short of phenomenal, and her brand new book Stylish Cakes: The Extraordinary Confections of the Fashion Chef showcases her most impressive creations. After working as a fashion designer for 30 years, Neuville made a seemingly drastic career move when she decided to trade in her sewing kit for a new kind of toolbox that included piping tips and whisks, but found that the worlds may not be so different after all. In both fields, each project starts as a detailed sketch, followed by hours of labor building a foundation and adding finishing touches as it takes on whatever personality she dreams up (girly, whimsical, edgy, etc.). And if anything, the connections she had made from her former career helped to catapult her new business amongst the fashion community. Her company, The Fashion Chef, started soon after graduating from pastry school, and she now boasts a very impressive client roster including notable figures like Anna Wintour and Oprah Winfrey. Stylish Cakes is perfect for any aspiring cake decorator as a source of inspiration and as a guide to creating some of Neuville's signature embellishments, including her sculptural gelatin bubbles, which we also get to share with you here. Read on for the full tutorial. Full disclosure: gelatin bubbles are time-consuming to create! You should allow 4 to 5 hours to make them and 12 to 24 hours for them to fully dry. When making the bubbles, it’s a good idea to blow up 20 to 30 percent more balloons than you think you’ll need for the finished gelatin bubbles for your cake. You need to allow for wastage, because it is very difficult to control the finished surface when you are making them, and not all of them will be pretty enough to use. The finished bubbles will also vary in size, with most of them in the 1½- to 1¾-inch range. The great news is that gelatin bubbles can be made well in advance and stored for weeks, allowing a head start on decorations for a big cake project. We keep ours in clear, airtight storage bins according to bubble diameter. The bubbles are edible, although they do not taste particularly good, so I recommend them as decoration only. 1. Cut a 5-inch strip of masking tape for each balloon. 2. Blow up the balloons to approx 2 inches in diameter and knot them securely. 3. Create a “stem” on the balloon by stretching the balloon neck and wrapping it tightly with the masking tape, starting at the neck and working down. Continue this procedure with the remaining balloons. 4. Place the balloons, stem down, on the wire rack to hold them in place. 5. Coat the palm of your hand with a small amount of shortening. 6. Then roll each balloon in your palm to coat them with a thin layer of shortening. Wipe off any excess; otherwise, the gelatin will not stick. 7. Now make the gelatin mixture: Add 12 tablespoons cold water to 6 tablespoons gelatin in a microwave-safe bowl. Stir gently to avoid adding air bubbles to the mixture. Microwave in 9- to 10-second intervals until the gelatin has completely dissolved. 8. Remove the bowl from the microwave and skim off any foam or undissolved gelatin. Let cool to lukewarm. 9. Add 2 tablespoons of the luster dust to the gelatin mixture and stir gently to dissolve. 10. Hold the first balloon by the stem and dip it into the mixture to coat the entire surface evenly. Let rest for a minute or so, until the mixture has set on the balloon. Repeat the dipping process, for 3 to 4 coats in total. Stir the gelatin mixture occasionally through the coating process, as the luster dust will settle to the bottom. If the mixture cools too much, place it in the microwave and set on reheat for 4 or 5 seconds. Since the gelatin will shrink as it dries, make certain the shell is thick enough that it doesn’t collapse when the balloon is popped after drying. 11. Place the balloon on the wire rack to dry. It will take the balloons approximately 12 to 24 hours to air-dry. Placing a fan on low in front of the wire rack will speed the drying time to several hours or overnight. 12. Once the balloon is dry, cut off the stem. Using your finger, gently press the balloon to help separate it from the gelatin bubble at the opening. Use a sewing needle or straight pin to puncture the balloon. Remove the balloon and use scissors to cut away the rough edges at the bubble opening. 13. When you decorate the finished cake with gelatin bubbles, the trimmed edge of the bubble will be the base that you will attach to the finished cake. Apply piping gel to the edge of the trimmed opening to secure the bubble to the cake. Cover, images and recipe text excerpted from Stylish Cakes: The Extraordinary Confections of the Fashion Chef © 2015 by Charlotte Neuville with Michael Coffindaffer. Reproduced by permission of Harper Design, an imprint of Harper Collins Publishers. All rights reserved.